Excluding the natural amber eyes of wild hares, seven common eye "colors" are found in domestic rabbits. Within those seven hues the shades can vary; some blues are lighter than others, for example, but these differences do not have separate or specific names. Of these, only shades of browns, blues and blue-grays are actual hues. Pink eyes occur as a result of a rare mutation whereby a rabbit inherits two copies of a recessive gene that dilutes brown eyes to a pink appearance. Ruby/red eyes result from the non-pigmentation of albino rabbits. Animals with albinism lack melanin, and therefore have no color at all, coats and eyes included. The red color we see is actually due to the blood vessels in the eye. Marbled eyes can be any combination of browns, blues and blue-grays, and is a genetic anomaly called sectoral heterochromia. The iris of a marbled eye is divided into sections of varying sizes, each a different color, so one eye may be both brown and blue, or blue and blue-grey. Flash red refers to the fact that rabbits lack a tapetum lucidum, the layer of tissue seen in eyes of many animals -- cats for example -- that reflects light. Camera flash is so bright, however, that it produces a different sort of reflection off of the retina itself, causing the eyes to appear bright red. If this sounds familiar, it's because humans also lack a tapetum lucidum, giving us that annoying red-eye when photographed looking directly at a flash camera. Rabbit eye color is not entirely different from coat color in that both stem from the same two pigments: the dark brown eumelanin and light brown pheomelanin. What alters the shades of color is the relative size of the melanin particles. Eyes more dense in melanin will appear darker brown, while eyes harboring smaller particles of melanin look blue. 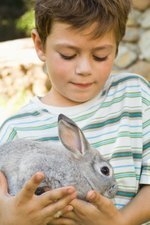 As rabbits age, their eye color darkens, as the size of the melanin particles in their eyes naturally increases. This change will be more pronounced in some breeds than in others, as genetics plays a large role in pigmentation. This is one more trait they happen to share with us, as most human infants are born with blue eyes that could eventually change as they grow older: Melanin in our eyes is typically not developed at birth.